The studies and researches on woodworks in Turkish art has a very recent past. Nevertheless, the studies and researches on this subject following the articles in a general approach, developers in a more concentrated way day by day, with studies on woodwork techniques, monographs and definitions and descriptions of woodworks in some encyclopedias and museum brochures. However, the final word has not yet been said on the subject of woodworks in Turkish art. We unexpectedly face with beautiful columns worked in detail, stalactitical pillar heads, pulpits, ceilings, planks in Turkish architecture and with Koran cases, reading desks and consoles made of wood. Furthermore, we can find the most beautiful examples of this work in the present day antiques shops, museums and private collections. In the method of carving, a pointed chisel works out the decoration in raised form by carving the surface of the wood. In this method, there is deep carving and slanting carving. There is no ground in this technique, but various compositions carved in the from of palmettes, lotus leaves and spiral leaves. 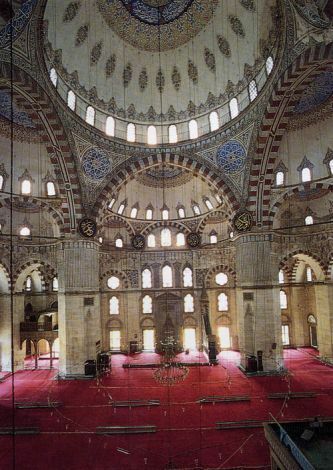 The carving method used by the Seljuks have been replaced by dovetail works of the Ottomans. This work is done by attaching small geometrical pieces by morticing and tenoning. Since the veins of the pieces come crosswise in this method, no deviations and deformities occur due to humidity and heat, and the works preserve their proper appearance over centuries. In later periods, inlaying has been widely used besides dovetail works. In this method which is divided as inlaying of mother-of-pearl and inlaying of wood, the decorative design is drawn on the finished surface by a pointed pencil and the proper places of the design is engraved and then inlaid with mother-of-pearl, tortoise shell or ivory. In another kind named as "Damascus work", the pieces of mother-of-pearl are surrounded by thin metal work. Various wood works unearthed in the Central Asian tumuli and Pazyryk excavations, have revealed that Turks were interested in this subject since ancient times. In Islamic art and especially in Omayyad and Abbasid wood works, we find a tendency towards a new style. The Syrian and Egyptian stone reliefs of the 10th-13th centuries had influenced the Fatimid wood works and decorations of acanthus and vine leaves peculiar to Syrian region were widely used. For example, the stone reliefs on the front of the Meshatta Palace was revived with nuances in the Omayyad and Abbasid works, was a favourite decoration of this period. The most famous example of Omayyad wood works is the multi-pieced pulpit of the Kayravan Mosque made in the 11th century and presently kept in the Cairo Museum, and the wood works in the El Hakim Mosque reveal the most interesting examples of Islamic wood works. The magnificent gate displayed in the Metropolitan Museum and the wood works displayed in the Cairo Museum, prove that the Fatimid decorations were oriented towards animal motifs in later periods. These decorations which are thought to be related to native art, include hunting scenes, symmetrical group of birds of animals. This style later influenced the Mameluke art and decorations were enriched with all-over designs. Wery few examples of Persian wood work preceding the Seljuk period have survived until the present day. Some wood inscribed with Cufic writing are found in Tashkent and Samarkand Museums and in private collections. Mongolian wood works of the 13th - 14th centuries are also very rare. Wooden doors with Cufic inscriptions shown great similarities with stone decorations in the architecture of the period. Seljuks considered wood works very important and they have produced many works of art such as pulpits, reading desks, chests of drawers in addition to the architectural elements ornamenting buildings. Geometrical forms and plant motifs were often used in the Seljuk wood works where carving and latticework were widely applied. The decorations were usually raised and the compositions were completed by Rumi style borders. The motifs of peacocks, King Solomon's seal and cypress trees were largely used in the Seljuk wood works. The pulpits of the Konya Alaaddin Mosque, Manisa Grand Mosque, Birgi Grand Mosque are the most beautiful pieces of the Seljuk wood works in Anatolia. The Seljuk wood work reveals itself on the wooden sarcophagi. The sarcophagus over Mevlana's grave in the Konya Mevlana Tomb is decorated with embellishments characteristic of the age and is covered all over with lyric poems and couplets. The Seljuk wood works influenced the early Ottoman wood works of the 14th -15th centuries and various works were started to be made by new techniques and with new decorative elements. Besides carving and latticework, dovetail method was widely used and enriched wood works were made also with the addition of auxiliary elements such as mother-of-pearls, tortoise shells and ivory. Floral motifs were often used in addition to Rumi compositions. Beginning with the 16th century, the Rumi decoration on the wood works gained a much more complex appearance by uniting with different floral patterns found in the similarly decorated tiles. Although the forms used in the 16th century wood works were continued during the 17th century, new patterns were created in decorations. The most renowned of these are the floral motifs which have lost their original forms in a tendency of stylisation. Plainness was gradually left and a richer embellishment replaced it. With materials such as mother-of-pearl, tortoise shell and ivory used in the 18th century wood works, the products gained a more colourful appearance. The influence of the Baroque and Rococo styles to be found in almost every branch of Turkish art, has revealed itself also in the wood works of that century. As an inevitable consequence of this, the Turkish wood works lost its own characteristics and came under the absolute influence of European art. The Turkish wood works have influenced architecture, presenting fine examples in old Turkish houses as well as the wooden Afyon Grand Mosque, Sivrihsar Grand Mosque, Beysehir Esrefoglu Mosque. Especially the ceilings of rooms, the shelved niches and cupboard doors have been fastidiously worked.